When a dolphin has one of its senses blocked, it can use other senses to mimic a human's movements, according to a recent study. GRASSY KEY, Fla. — A dog may be man’s best friend, but dolphins can imitate human actions, and even how they solve problems. When a dolphin has one of its senses blocked, it can use other senses to mimic a human’s movements, according to a recent study. 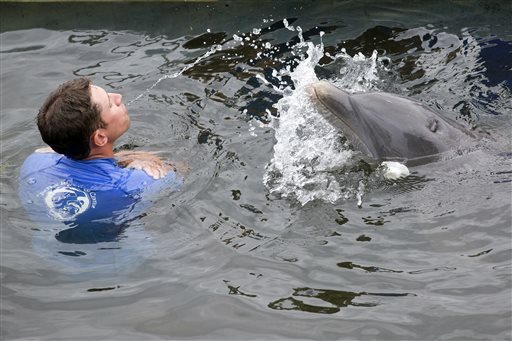 A bottlenose dolphin named Tanner was blindfolded and instructed to mimic the actions of a trainer in the water with him. When Tanner wasn’t able to use sight to figure out the movement, he switched to another technique: emit sounds, listen to the echo and interpret the resulting sound waves. This ability — known as echolocation — allowed Tanner to replicate movements by the trainer, such as spinning in the water. The study, conducted at the Dolphin Research Center in the Florida Keys, expands on previous studies looking at how dolphins are able to imitate other dolphins while blindfolded. To see if a change in sound would affect their imitation, researchers used humans instead of dolphins to make the movements in the water. Dr. Kelly Jaakkola, research director of the nonprofit marine mammal center, said researchers were surprised by Tanner’s use of echolocation. “He outsmarted us,” Jaakola said. Janet Mann, a professor of biology and psychology at Georgetown University who was not involved in the study, said the results were not surprising in that they were consistent with how dolphins act in the ocean. “Of course they would use their echolocation to get more information. Dolphins have to solve problems all the time in the wild,” she said, adding that dolphins use echolocation more at night as well. Guarino indicated to Tanner that he was supposed to imitate, and placed latex eyecups over each eye. Another trainer in the water was then shown a clipboard with a written behavior to perform. Wordlessly, that trainer began to spin in the water with his arms wrapped across his shoulders. Tanner then did a similar spin. For the study, published online in the scientific journal Animal Cognition, researchers tested a dozen behaviors that Tanner already knew, including bobbing up and down, blowing bubbles underwater, swimming like a shark with the tail — or feet — moving side to side and floating on top of the water. Each behavior was tested twice at random, with and without the blindfold, as researchers recorded echolocation sounds underwater. Tanner was just as accurate at imitating a human — blindfolded or not — as he was at imitating another dolphin, researchers determined. The study included six sessions spread over a nine-day period. That kind of flexibility with imitation is more commonly associated with humans. But humans and dolphins are separated by about 90 million years of evolution, and their imitation skills likely evolved separately. So exploring imitation in those species “has the potential to give us clues into why imitation ever evolved at all,” Jaakala said. Further testing is needed to see if other dolphins can imitate as well as Tanner. “But we have no reason to believe that this dolphin was just an Einstein dolphin that did this,” she said.